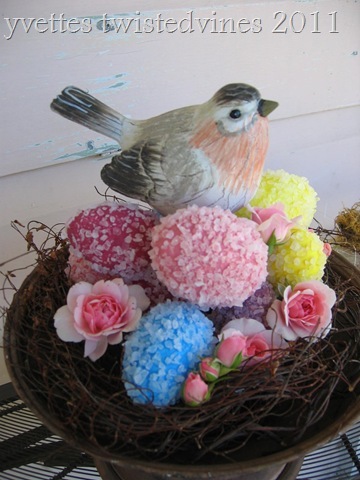 What a lovely way to celebrate Spring, combined with a touch of Easter. 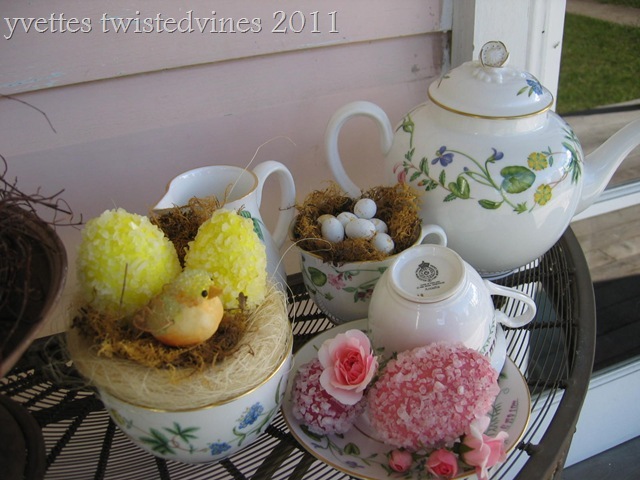 Another Spring theme teaset from my sister’s collectables. Royal Worcester – Arcadia. Tiny petite pastel flowers. 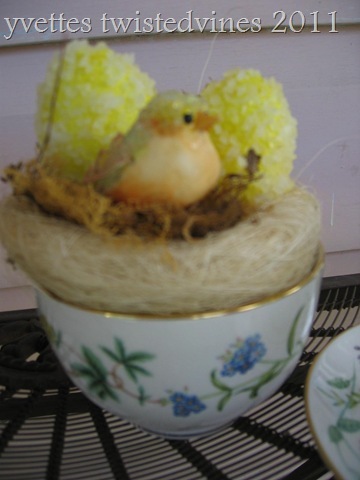 Accompanied by my handmade salted encrusted eggs –tutorial found here. Since 1751, Royal Worcester has produced top quality china. It is said to be one of the few enterprises where the traditional craftsmanship of the eighteenth century still survives. This teaset is just adorable and I love the teapot. It even has flowers on top of the lid. With gold trims around the edge of the plates and cups. Dr. John Wall, a gifted surgeon and local pharmacist stumbled upon a formula for “soft paste” porcelain. The paste formula was unique for its time and received much attention, as it did not crack when exposed to boiling water. With this industry-changing formula in hand, Wall and his associate secured local financial backing and formed Worcester – Tonkin, a porcelain studio on the banks of the river Severn in Worcester, England. Tutorial to make these eggs can be found here. Take a look they’re so fun and easy to make! I recently bought a Royal Worcester ‘Evesham’ plate with apples and blackcurrents on, to hang on my kitchen wall. What a lovely tea set Yvette. What a pretty setting – I love all the pastels. What a great vignette! I love the eggs – so clever. Your tea set is so pretty. Thank you so much for sharing the tutorial on the eggs. They are so cute. Gorgeous mosaic, and now I’m looking forward to Easter. Those salted eggs I must try look so fun. You always give such good information. I love to know the history or the why behind things! 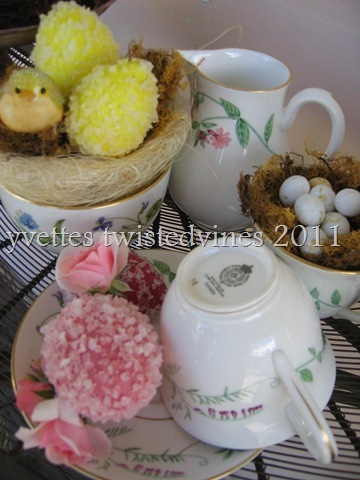 What a wonderful springtime tea post! I’m going to be taking a look at those eggs; I enjoy crafts. Your teapot is adorable and I can see why you love it! Thank you for joining me for tea and I hope you have a wonderful week. Your spring tea is lovely, especially the pretty tea pot. The eggs you make look interesting and I’ll have to check your tutorial. That tea set is adorable…I like Royal Worcester so much! Love your mosaic. You are inspiring me to start on some Easter preparations. 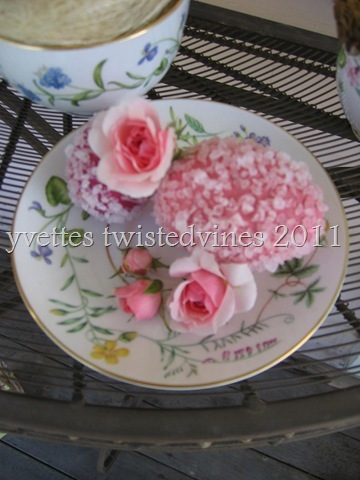 Such pretty tea things. I’m amazed at the huge variety of china. And such sweet springy colors! Lots of fun stuff over here! I really love your pretty tea set! They’re really stunning and gorgeous. So Egg-static! !loving everything i see in the post, the tea set is lovely, Thanks for sharing the tutorials links! i’m gonna check them out! Susan. awesome clicks…first time to your space ..love your presentation …very interesting posts..
oh my, I haven’t even thought of Easter cooking! Thankyou for sharing your delightful mosaic and the nudge to cook something! Thankyou also for coming to my blog, and for your comments. I appreciated hearing from you. Ahh! Lovely tea set and such a fantastic story! How wonderful the discovery – and we’re beneficiaries of it! 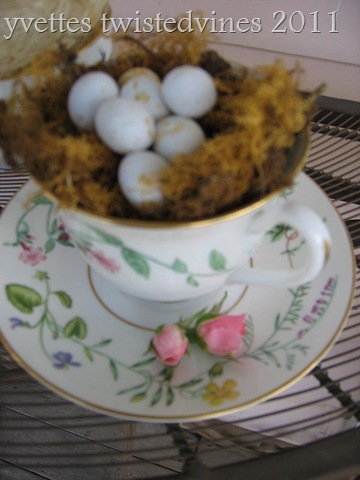 The pattern is so delightful – I will try this egg decorating – it looks like lots of fun! How pretty this all is. I really like the salt encrusted eggs. They are very unique. Thanks for stopping by! Your teaset is just beautiful! The colors are so perfect for Spring. Your entire post is filled with such lovely SPRINGNESS! 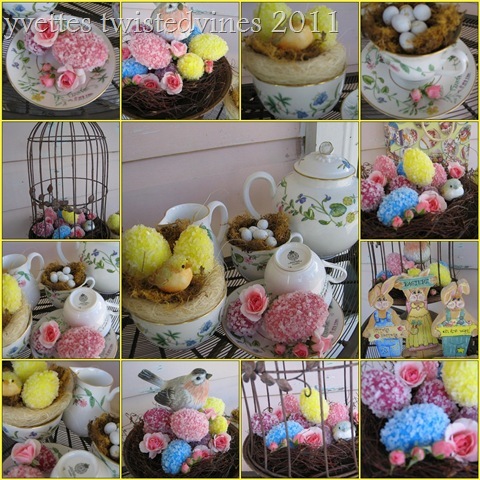 It is spring here so your mosaic is a perfect Springtime vignette! Your salt encrusted eggs look very unique! I will save your tutorial and see if I can find some Styrofoam eggs to try making a few. Thanks! Yvette, Your spring mosaic is just gorgeous! Love your springy teaset, too. Very pretty. Such a beautiful Easter post! Your collage at the top is amazing. I love your tea cup with it’s lovely florals. 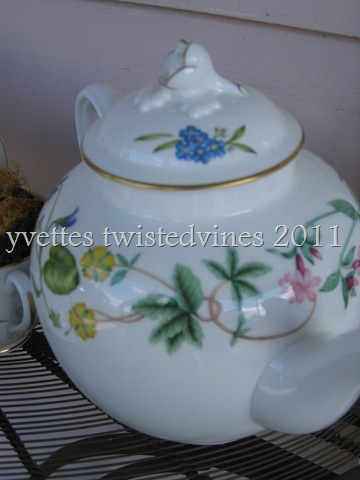 The tea pot too is really pretty. Thank you so much for sharing your beautiful and informative post. 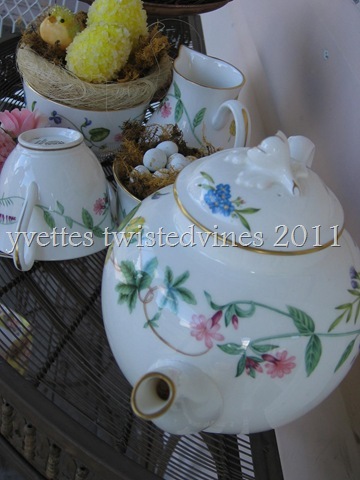 Your sweet tea set is perfect for spring! 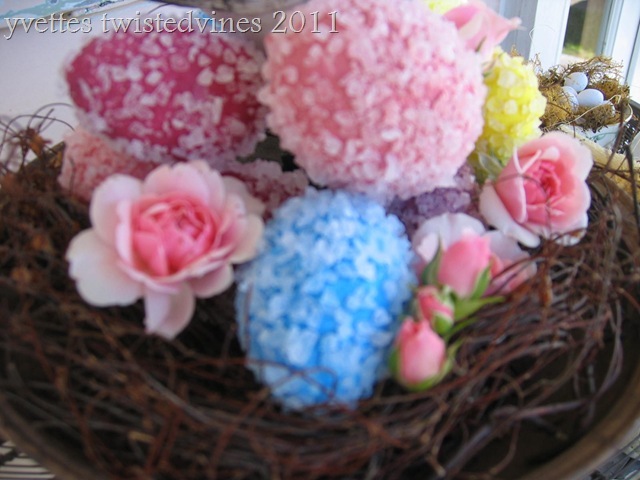 Love your pretty spring decorations, and the rock salt eggs are darling! Thanks for sharing! what a beautiful teaset. Easter will be exceptionally beautiful with these! ahh this is fun post and so springy! love the pastel colours combo! my fave! love love love them all! 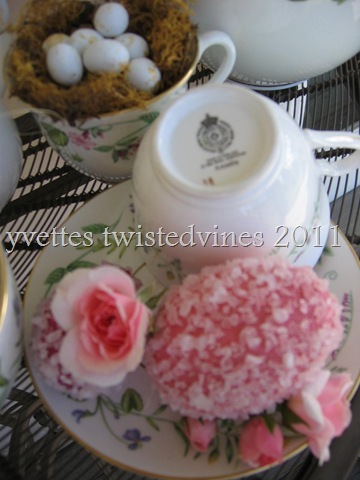 Love your mosaic of beautiful photos showcasing the tea set and your sisters collectables. So pretty, so Spring-like/Easter like. If you have not entered my give-away and would like to, please stop over and do this. Blessings. Next PostHippety Hoppety..Easter’s..on its way!